Administrators are an undeniable group of contributors and their role in driving the direction of a university besides it being driven by academics and students. 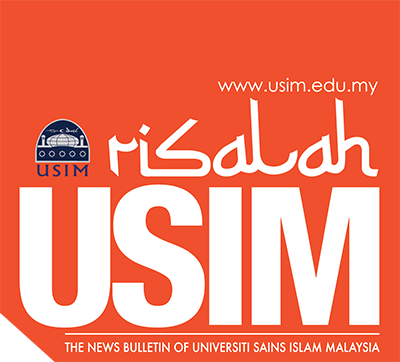 In conjunction with the Month of the Administrators of Universiti Sains Islam Malaysia (USIM), which is celebrated every August, a special interview by Mohd Zaini Othman, Assistant Registrar of Strategic Communications Center with a distinctive figure to USIM administrator Mr Muhammad Haizuan Rozali, The Registrar of USIM. Q1 How do you see the administrators and university intertwine? The existence and role of the administrator exists and evolves in parallel with the evolution of the higher education system itself that shifts from classical education to a contemporary education. In the early days of higher education, it was synonymous and moved as a center of knowledge that was only within the scope of ‘pupils and teachers’ relationships in pursuit of knowledge. Although known as the center of knowledge during those time, it has not made its role as seen today. At that time, it had not yet talked about the physical element, the space and the system around it. It was only limited and focused on solely the delivery and understanding of knowledge because the center of knowledge at that time was known only as a place for community to seek truth. At this point the need for the university to create the new cluster within its organizational framework as well as a group of academic and student groups ie administrators was seen. These administrators are professionals capable of managing, making decisions and discerning in areas such as engineering, finance, information and human resources at the university. This group is entrusted as a major milestone for managing the university from time to time as their ultimate responsibility. Q2 Are the administrator’s functions still needed in the current reality? As I share about direct affiliation with administrators and universities, the bond will always exist. This is because starting from the needs of the administrators to exist and is crucial in the development of a university, the definition of an administrator is still relevant to the role of administrators today. The only difference is how to measure the existence of the administrator is celebrated and its survival is required in the increasingly challenging ecosystem of the university. This is where the skills and spikes in the experience of this group of administrators are heavily billed and developed in steering the university. For that reason, I think, the role of the administrator is always significant from the past to the present and the future. But it should be equated with its professional ability in performing its functions at the university. Q3 What should administrators do in facing the challenges of university management today and in the future? Administrators should observe and differentiate to create a culture of followers or leaders as a reference to their ownselves. The university administrator for me is an academic civil servant, hence they do not have to be too attached and rigid to the government’s organizational style out there. Communication skills need to be improved and mastered best. We need to play practically no longer understanding the theory alone. This is because good communication skills will be the best tool in the process of negotiation, bargaining power, decision making and implementation of effective delivery systems. This will highlight the personality of an administrator plus the other qualities that the individual has. As an administrator in university, this group should take a step to understand visually and strategic issues of higher education so as not to miss out and be able to respond clearly and thoroughly to any issue that arises. The authority of an administrator becomes more apparent when it is capable of making decisions and advising stakeholders make decisions. Being in a large organization like this university, we have stakeholders coming from various levels that need to be well managed. For that reason, the administrator must be able to adapt the flexibility and accommodation of the feeling well. In that way, it makes the administrator always in the interest of every sector and situation. Administrators also need to be able to build a wide range of networks with multiple parties and attempt to synthesize these network resources as an energy mobilizing university. Q4 What is the benchmark of an administrator’s success that we desire? For me, one of the managers’ benchmarks is that we can measure the expectation and experience points of both employers, colleagues and customers and their impact can be felt. As an administrator in an organization, we offer a wide range of services to our customers. Hence, we need to make sure that whatever the form of service is we can deliver and the customers experience it. Here the role of the administrator is important to oversee all administrative work processes to achieve the goals outlined. If there is a gap, the administrator will immediately be working and innovating to find a solution. For universities to remain sustained and relevant, all quarters including administrators who are in it need to constantly explore and quickly adapt to current issues, creative work and be responsive in delivering feedback. We can no longer remain in the old work culture and if the administrator does not act, think and restrain himself from making reforms, this is a big problem. Administrators as individuals whose souls are for the university, should take on the role of being an effective supervisor to all the administrative affairs of the university because we want to give benefit the university and our stakeholders. Q5 Recommendations to be shared with the university’s administrators? Administrators should always be alert with current developments that occur either locally or globally. It is particularly daunting if there is a culture among administrators not wanting to address current issues, therefore they will fail to analyze issues thoroughly and carefully. Hence, it needs to be cultivated and becomes a routine for many administrators to read and to take into account all current issues happening around them. We are now in the strategy going towards a “Barakah Campus” which makes us unable to escape from associating it with the concept of maqasid shariah, the concept of charity ma’ruf nahi munkar (calling for the good to prevent evil) and understanding that work is an ibadah. It all comes from a touch point of the individual which is the qalbu (heart). Thus, if all of our charitable deeds are maintained with the qalbu element, we will produce an administrator relevant to the changes and development of the university. Q6 To end this interview, what is the expectation that the Registrar wishes to convey to the administrator? I am always keen to see the administrators continue to be credible in the strategic position of the university. The authority is based on professionalism and the capability of making strategic and mature decisions. In addition, I also urge the administrators to constantly increase knowledge because we can distinguish one person clearly by looking at his credibility portrayed with own initiative to constantly explore and increase knowledge. This makes a person to become more dynamic and valuable.